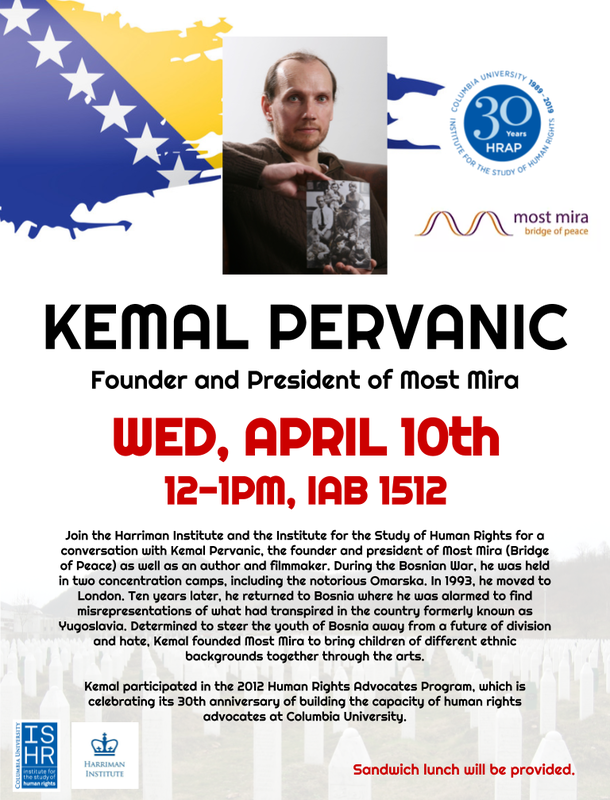 Join the Harriman Institute and the Institute for the Study of Human Rights for a conversation with Kemal Pervanic, the founder and president of Most Mira (Bridge of Peace) as well as an author and filmmaker. During the Bosnian War, he was held in two concentration camps, including the notorious Omarska. In 1993, he moved to London. Ten years later, he returned to Bosnia where he was alarmed to find misrepresentations of what had transpired in the country formerly known as Yugoslavia. Determined to steer the youth of Bosnia away from a future of division and hate, Kemal founded Most Mira to bring children of different ethnic backgrounds together through the arts. Kemal participated in the 2012 Human Rights Advocates Program, which is celebrating its 30th anniversary of building the capacity of human rights advocates at Columbia University.